Omni Healthcare is suing wholesale drug distributor McKesson Corp. on behalf of the federal government and 30 states for allegedly repackaging cancer drugs from single-use vials at the expense of the government and patients. McKesson is one of the largest pharmaceutical distributors in the country and is accused of violating the False Claims Act. The lawsuit, filed late Tuesday afternoon in New York federal court, alleges McKesson repackaged the "overfill" from vials of Aloxi, Procrit and other oncology drugs into non-sterile syringes and sold them to cancer centers, medical practices and physicians. The providers would then bill the government for the drugs. Omni alleged that over a 10-year span McKesson intentionally put cancer patients at serious risk for infection while defrauding federal, state and local governments out of hundreds of millions of dollars. McKesson "learned that they could maximize profits at the governments' expense by harvesting overfill in covered drug products such as the oncology drugs, pooling the oncology drugs, and then repackaging them in bulk into non-sterile and plastic pre-filled syringes, despite the clear risk to vulnerable cancer patients," the complaint said. The vials are labeled single-use because the drugs don't have preservatives that prevent bacterial growth. Also, distributors aren't charged for overfill, and the providers they sell the drugs to are not allowed to bill the government for it because they were repackaged in unapproved facilities. 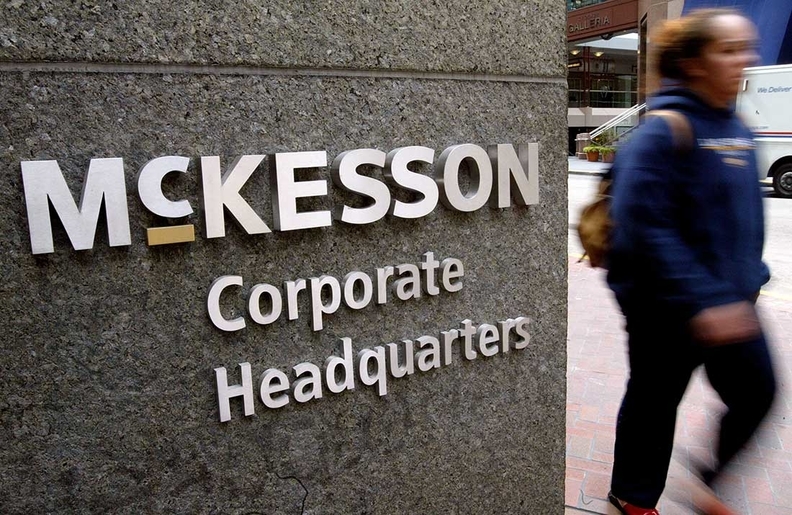 That allegedly allowed McKesson to offer discounts to providers for the pre-filled syringes, which they would purchase instead of the vials, amounting to a kickback, according to the complaint. Omni Healthcare, which includes a network of cancer clinics in Florida that received cancer drugs from McKesson, is suing McKesson on behalf of the federal government, 30 states and Washington D.C., and the cities of Chicago and New York. McKesson could face a $10,000 fine per False Claims Act violation, plus three times the amount of the damages sustained by the government. McKesson's competitor AmerisourceBergen was accused of similar behavior in another case that resulted in fines, penalties and a civil settlement that amounted to nearly $1 billion, according to court records. If the allegations hold up, the penalties have to hurt McKesson's financial condition enough to change its behavior, said Kerry Harvey, a member at the law firm Dickinson Wright. "It gets down to a simple cost-benefit analysis," he said. "Does the potential risk of penalties outweigh the very real benefit of taking these liberties with the rules? Or else it runs the risk of being written off." In addition to allegedly "fraudulently inducing reimbursements," the overfill inflated the average sales price of the drugs that the government overpaid for, according to the lawsuit. McKesson is part of the "big three" wholesale drug distributors, along with AmerisourceBergen and Cardinal Health, which collectively have more than 85% market share of the pharmaceutical supply chain. McKesson supplies more than 40,000 healthcare facilities in the U.S. The company reported nearly $200 billion in revenue in 2017, the vast majority of which comes from its distribution solutions business. Omni claimed that the company's alleged "profit motive" also caused it to contaminate the previously sterile drugs by skimming overfill and shipping and storing the products improperly. McKesson "presumably assumed that any infections and resulting patient deaths would likely be falsely attributed to the patients' disease and treatment, as opposed to healthcare providers' unwittingly administering non-sterile and unapproved drugs," the complaint said. Allegedly, an Omni employee saw McKesson employees pool overfill from the FDA-approved packages of the cancer drugs in a non-sterile facility in Frisco, Texas. The products were then placed into pre-filled syringes that were re-labeled—in some instances with fake product codes and expiration dates, according to the lawsuit. Also, McKesson subsidiary U.S. Oncology and its affiliated physician offices would allegedly extract a dose, collect what's left over from the single-use vials and then bill the government for that overfill, according to court records. In March 2000, the drug manufacturer Amgen sent a letter to providers regarding 21 reported cases of patient reactions resulting from the contaminated drug Epogen, which treats anemia caused by chemotherapy. The letter reminded providers that "multiple entries should not be made into single-dose vials, and residual medication from two or more vials should not be pooled into a single vial. … Once a syringe has entered a single-dose vial, the sterility of the product can no longer be guaranteed." "Some of the most senior government officials charged with ensuring the health and safety of Americans recently publicized their concerns that defendants are above the law—that they have harmed and will continue to harm millions of Americans, for profit, and with impunity," the complaint said. "As evident in this action, (McKesson) continues to elect corporate revenue over patient safety." Clarification: The story was updated to reflect that Omni Healthcare sued McKesson on behalf of the federal government, 30 states and Washington D.C. and the cities of Chicago and New York.